Kakadu is a living cultural landscape with World Heritage listed rock art sites throughout. Some sites have been dated at over 20,000 years old and provide a visual record of the the oldest living culture on earth. Within the Park there are 3 rock art sites open to the public and each offers something different and worthy of exploration. The 3 sites include; Ubirr, Nourlagie & the lesser known Nanguluwurr. One of the largest and most popular art sites in Kakadu, allow an hour or two to explore the three main sites. The main gallery is under a large rock overhang, the x-ray art here pays respect to the enormous variety and abundance of traditional food available. Animals were painted to ensure future hunting success or to illustrate a noteworthy catch. These art works were painted during the freshwater period, less than 1500 years ago when wetlands replaced saltwater systems and brought new food resources to the area. Don’t miss the Thylacine (Tasmanian Tiger) painted close to the main gallery. Archaeologists suggest that they have been extinct on the mainland for 2,000-3,000 years. There are also some fascinating examples of Contact Art; which records the arrival and contact between Aboriginal culture and the Macassan, Chinese and European cultures. Look for the early ‘whitefellas’ depicted at Ubirr, marked by their boots and trousers, rifles and tobacco pipes. For an unforgettable experience don’t miss the climb to Nadab Lookout. A fifteen minute uphill walk to undoubtably the best views in Kakadu. Overlooking the East Alligator River and Nadab Floodplain, here you can see all the way into Arnhem Land. The floodplains come alive in the late-afternoon as the sun sets and you take it all in from the top of the ancient stone country. Just magic - we can see why it’s one of the most visited sites in Kakadu National Park. The main gallery at Ubirr is wheelchair accessible. Open from 8:30am – sunset (1st April – 30 November) or 2pm – sunset (1st December – 31st March) *Please note the road to Ubirr is often impassable in the wet-season (Nov-April) due to flooding so please check the Kakadu Access Report before visiting. The main gallery can be found under the Anbangbang rock shelter on the southern side of Nourlangie rock. Archaeologists have revealed that aboriginal people have been using this shelter for around 20,000 years. Some of the best examples of dynamic figures in Kakadu are found here. Namondjok, the creation ancestor who broke the kinship laws and now resides in the night sky. Namarrgon, the lightning man, a creation ancestor who is still very active today, bringing the violent thunder and lightning storms each wet season. His wife Barrginj and their children, depicted as the Alyurr (Leichardt’s grasshoppers) are also found here. 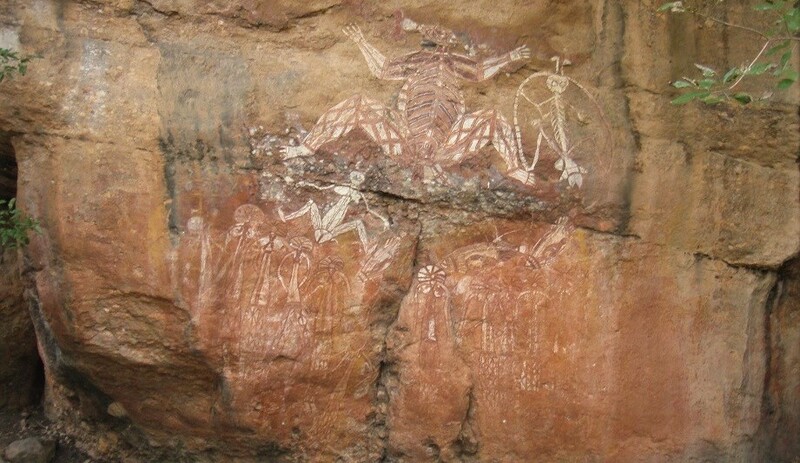 These ancient paintings tell sacred stories of language, beliefs, values and the epic history of human occupation in Kakadu. Poignant reminders of the moral and ethical codes of Aboriginal culture and how storytelling and rock art can bring 50,000 years of culture alive. A not to be missed rock art site. 1.5 km circular walking track. The main gallery at Nourlangie is wheelchair accessible. Open 7am – sunset all year round. *Please note the road to Nourlangie very occasionally becomes impassable in the wet-season (Nov-April) so please check the Kakadu Access Report before visiting. Often overlooked this small rock art site has an excellent collection of the various rock art periods and styles. There are hand stencils otherwise known as object prints which are probably the earliest style of rock art found in Kakadu. Some fantastic dynamic figures are also found here, exquisitely drawn spirits and mythical figures in large head dresses with spears and boomerangs which date from the pre-estuarine period approximately 50,000 – 8,000 years ago. There is also a fine example of some much more recent Contact Art, a two masted saling ship complete with an anchor and a dinghy. A must see site if you are able to walk the 3.4 kilometre return walk. 1.7 km walk each way - moderate fitness required (no wheelchair access). Open all year round (weather permitting). *Please note the road to Nanguluwurr is often impassable in the wet-season (Nov-April) so please check the Kakadu Access Report before visiting. If you'd like more information about any of the above rock art sites or would like to join a Kakadu tour to see one please contact Venture North Safaris.